What's it like, exactly, to play guitar in a Led Zeppelin tribute band? We decided to ask three of the best. Zepparella rocked thethird annual Malibu Guitar Festivalthis past weekend—and they had a little help from Steve Vai. 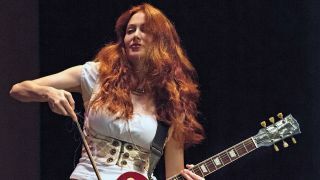 Zepparella guitarist Gretchen Menn’s new conceptual work, Abandon All Hope,is an eclectic study of guitar, art and literature.